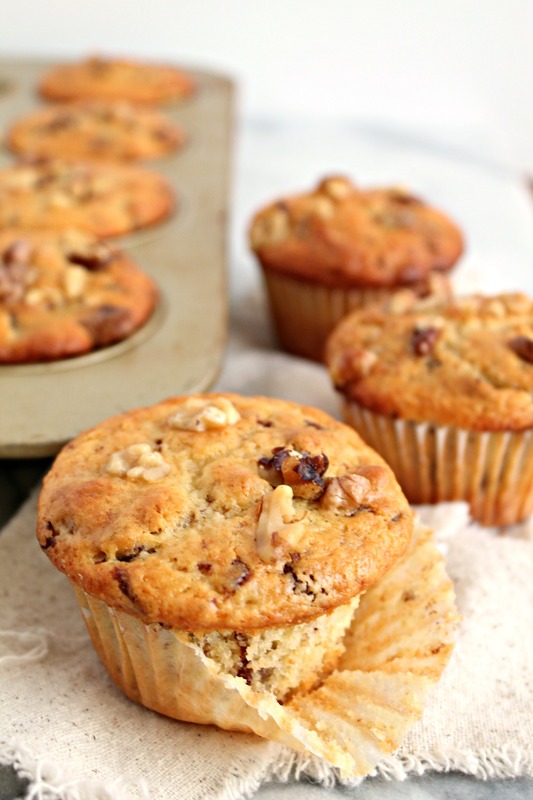 Chocolate Walnut Yogurt Muffins are a great treat to have around when you want something sweet, but a tad healthier. They’re packed with fiber from flax seed meal, but with a hint of indulgence from chopped milk chocolate. This post is a sponsored post on behalf of Stonyfield and Divine Chocolate. All thoughts are my own. I’ve started baking on Saturdays, so that I can easily bring the baked goods to church on Sunday for coffee time. This is my way to still bake for the blog without consuming endless of sweet, delicious calories I don’t really need. Plus, I get to share my love for baking with friends! So I think it’s a win-win situation. Yesterday was one of those baking days, and this time it was muffins! 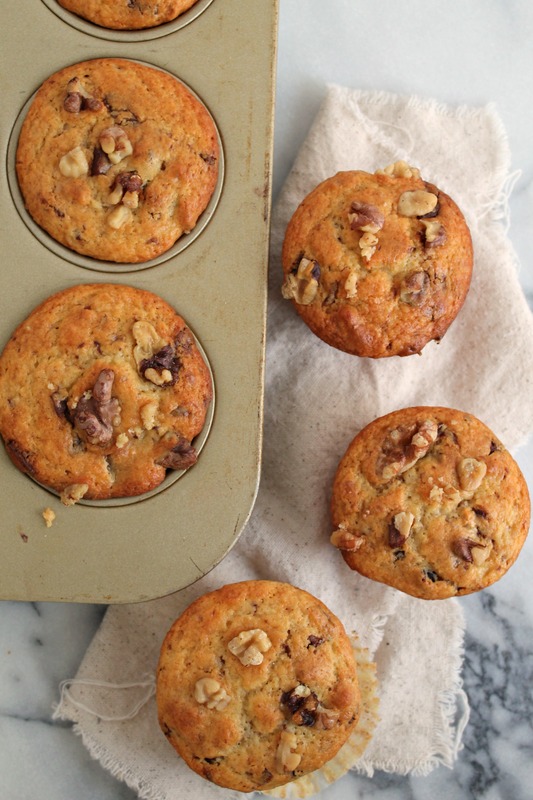 Chocolate walnut yogurt muffins, that is. Thanks to both Stonyfield Yogurt and Divine Chocolate, these muffins are packed with fiber, protein, and luscious milk chocolate chunks. It’s the best of both worlds in one bite, and they pair perfectly with your morning coffee or late night tea. Baking with yogurt is one of my favorite ways to add protein to baked goods, as well as adding a hint of tartness that balances out all that sweetness. Not only that, but when baking with yogurt, you can use a lesser amount of fat in your recipes because yogurt tends to add the moisture that fat usually does. I like having a balance, so you’ll see this recipe uses both yogurt and some melted coconut oil, which I also love baking with. The oil is folded in at the end and seriously makes this recipe shine. You can leave the oil out, but I suggest trying the recipe as-is first. Plus, coconut oil is one of the healthiest oils you can bake with, so don’t be afraid! The Stonyfield website is packed with great recipes to try – click here for more yogurt recipes. Oh and let’s not forget to mention the gorgeous milk chocolate I used in this recipe. Divine Chocolate is co-owned by the 85,000 farmer members of Kuapa Kokoo, the cooperative in Ghana that supplies the cocoa for each bar of Divine. As owners, the farmers get a share of the profits, a say in the company, and a voice in the global marketplace. Isn’t that amazing?! I think Divine is making strides in the fair-trade chocolate world, and they’re a company I am proud to support. So buy some Stonyfield yogurt and Divine fair trade chocolate, then bake up these chocolate walnut yogurt muffins! These tender, chocolate and walnut packed muffins are a great source of fiber and perfect as a mid-day treat! Preheat oven to 350F and line a muffin tray with liners. Whisk together the flours, baking powder, flax seed meal, and salt in a large bowl. In a separate bowl, fold in the sugar, vanilla, yogurt, and eggs. Combine the wet and dry ingredients. Fold in the melted coconut oil and add in the chopped chocolate and walnuts. Scoop into muffin liners and bake for 20-35 minutes until golden brown. Thank you for making such a delicious treat using Divine! It looks absolutely delicious.